Crumbs and Cookies: pierre hermé's passionately chocolate tartlets. These images were ready to go weeks ago but I couldn't find the words to accompany them, so I thought that I would put the post off until I could, but let's just say that there are wiser strategies out there. So allow me to proceed with a straight up description: the shine of the ganache is immensely visually arresting; the combination of passionfruit and chocolate is no less tasty than it is fancy, although I thought that the ganache tasted better on day two, when the sharpness of the dark chocolate has mellowed slightly (or go for a lower cocoa percentage from the get go! ); I have henceforth pledged to pipe ganache into tart shells as demonstrated and I hope I've convinced you to do so with me. In short, treat your eyes to these tarts too. Make the dough: Place the butter in the bowl of a mixer with the paddle attachment and beat on low speed until creamy. Add the sugar, almonds, salt, vanilla, and eggs, and still working on low speed, beat to blend the ingredients, scraping down the paddle and the sides of the bowl as needed. The dough may look curdled - that's alright. With the machine still on low, add the flour in three or four additions and mix only until the mixture comes together to form a soft, moist dough. Gather dough into a ball and divide into half. Gently press each piece into a disk and wrap each one in plastic. Allow the dough to rest in the refrigerator for at least 4 hours or for up to 2 days before rolling and baking. To mold the tartlets, butter and set aside twenty four 1 1/2 inch tartlet tins. Also set aside a 2-inch round biscuit or cookie cutter, as many 3 to 4 inch square pieces of aluminum foil as you have tins, and some dried pea beans or rice. Bake the tartlets: Preheat the oven to 350F. Remove the pan with the tartlet tins from the refrigerator and gently press a square of aluminum foil into each tin. Put a few beans or a spoonful of rice into each tin - just enough to keep the foil in place - and bake the tartlets for about 15 minutes. Remove the foil and beans and bake the shells for another 2 minutes or so, just until they are lightly coloured. Transfer the pan to a rack and allow the shells to cool to room temperature. Place the chocolate in a large heatproof bowl. Bring the heavy cream to a boil in a small saucepan; in another saucepan, bring the passionfruit juice to a boil. Pour half of the boiling cream over the chopped chocolate and stir gently, starting from the center of the bowl and then in increasingly larger concentric circles until the cream is incorporated. Repeat with the remaining cream and then, in the same manner, stir in the warm passionfruit juice. Cut the butter into pieces and add it to the ganache, stirring gently to combine. Chill ganache for 10 to 15 minutes until it is at a consistency that is firm but easy to pipe. 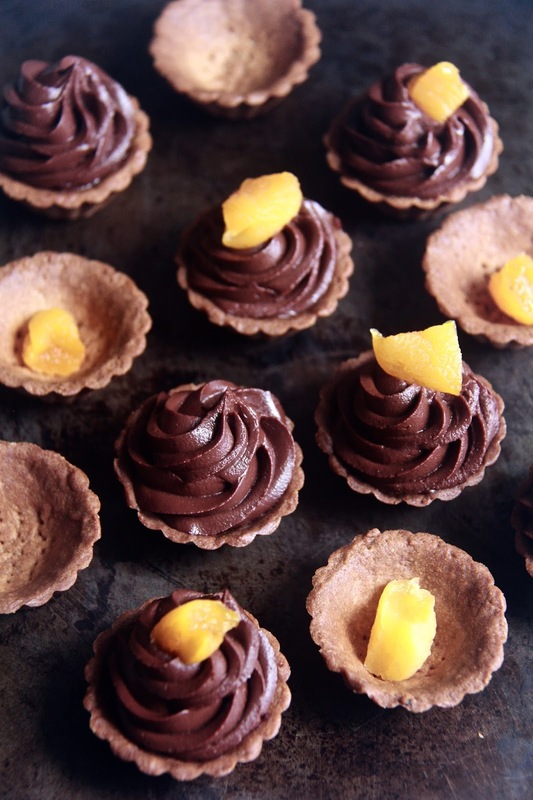 Assemble: Put a few small cubes of the steeped and patted dry apricots into the bottom of each tartlet shell, making sure to set aside a dozen or so cubes for topping. Spoon the ganache into a pastry bag fitted with a 1/2 star inch tip and pipe a swirl of ganache into each shell. 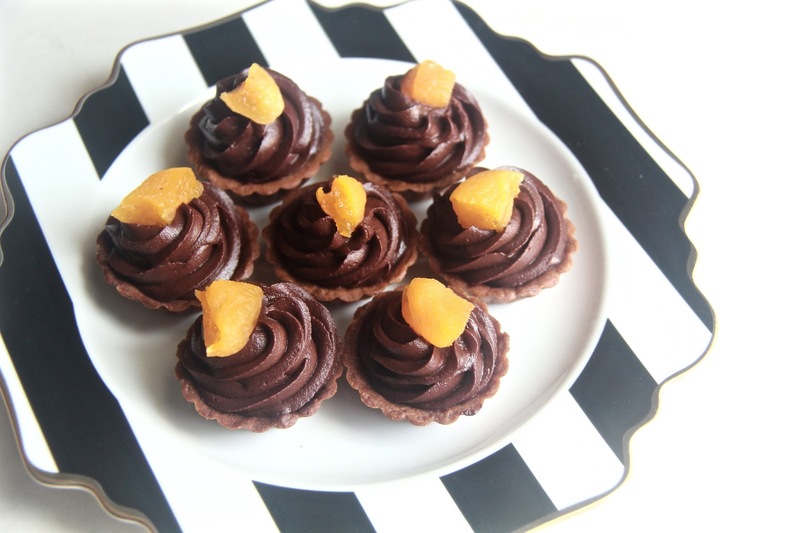 Put a cube of apricot on top of each tartlet and serve.